President Michael D Higgins has signed a warrant granting a posthumous pardon to a man wrongfully convicted and hanged over the murder of five people on the Galway-Mayo border in 1882. Myles Joyce, or Maolra Seoighe, was convicted and executed over the infamous Mám Trasna Murders. In August 1882, Joyce was one of ten men from the local area who were arrested and charged with the murders of five members of the same family in Mám Trasna, on the Galway/Mayo border. The trial was held in English, despite the fact that Joyce was an Irish speaker who did not understand English. He was one of three men hanged for the crimes. Shortly before their executions two of the men admitted separately that they themselves were guilty but that Joyce was innocent. This was deemed insufficient to postpone or revoke the execution and in December 1882, Joyce was hanged along with two others for the murders. Since then, questions have arisen regarding the safety of his conviction. There have been serious doubts surrounding the reliability of much of the evidence used to convict Mr Joyce, with the case widely viewed as one of the most blatant miscarriages of justice in British and Irish legal history. Witnesses in the case were also awarded significant compensation under the direction of the then lord lieutenant of Ireland. That advice was based upon an expert report commissioned by former taoiseach Enda Kenny. It is only the second time that a posthumous pardon has been issued, and the first time one has been issued to a person convicted before the State's foundation. 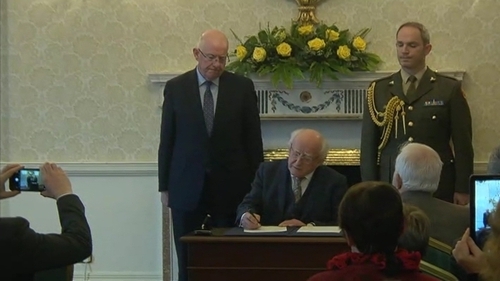 The first such pardon was awarded by President Higgins to Harry Gleeson, on the advice of former tánaiste and minister for justice, Frances Fitzgerald, in December 2015. The Tipperary man was wrongly hanged in 1941 for the murder of New Inn woman Mary 'Moll' McCarthy.